Membangan is a very rare tree native to Northern and Western areas of Borneo. It occurs wild and is also cultivated. in Dayak orchards in Sabah, Sarawak, Brunei and East Kalimantan, where it is common along the Middle Mahakam, less common in West Kalimantan. 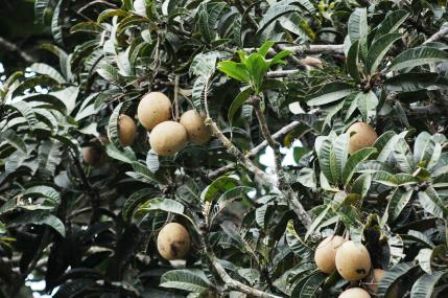 This attractive fruit tree has remained confined to its native area and was introduced in fruit tree collections outside Borneo only in the 1980s. Medium to large evergreen (sometimes deciduous) tree, 15-33 m tall, , trunk 30-70 cm diameter, bark brown or grey, smooth or fissured. Leaves elliptic-oblong to obovate-oblong (17- ) 28-45cm x (7- ) 10-15 cm, rigidly coriaceous, nerves prominent, petiole (2- ) 5-7 cm long. Inflorescences panicles, terminal or sub terminal, erect, pyramidal, up to 30 cm long, densely flowered, glabrous, fragrant; calyx 5-lobed; petals5, purple on inner surface, pinkish-white outside; stamens 5, 1 or 2 fertile; ovary white. Fruit a globose or ovoid drupe, 9.5-12(-20) cm x 6.5-10(-17) cm, rough potato brown, flesh bright deep yellow, sweet-acid, pleasantly aromatic, fibrous. Stone plump, ca. 9 cm x 6.5 cm x 4.5 cm, endocarp woody, up to 5 mm thick, seed monoembryonic. In Sabah trees flower in April-May and fruit between July and September; in East Kalimantan the fruiting season is December-March. Membangan are the in the genus Mangifera. They can be upto 20 cm in diameter. Ripe fruits are pleasant to eat, having a characteristic aromatic flavour. The fruit is peeled like a banana after making a longitudinal cut with a knife through the 1 cm thick skin. The bright deep yellow flesh forms an attractive contrast with the rough, potato brown skin. During the season they are The fruits are commonly sold in markets during the season. The skin is occasionally dried and used for sambal. In Sarawak, flushing shoots are sold as a vegetable. In flower M. foetida as well as M. pajang are beautiful ornamentals with upright inflorescences. 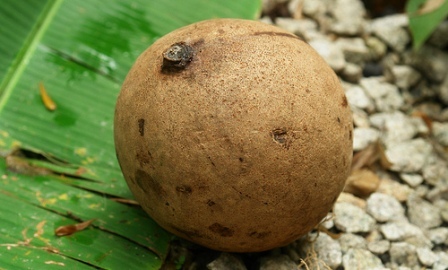 Membangan is basically basically a fruit tree and therefore cultivated for its fruits. But as the trees have very beautiful upright inflorescences too, so the these are also quite ornamental and can therefore be used for landscaping too. Propagation is by seed as well as by modified Forkert budding. Since the trees grow quite large, so these should be planted in orchards12-15 m apart. There are no special cultivation techniques required for growing membangan. 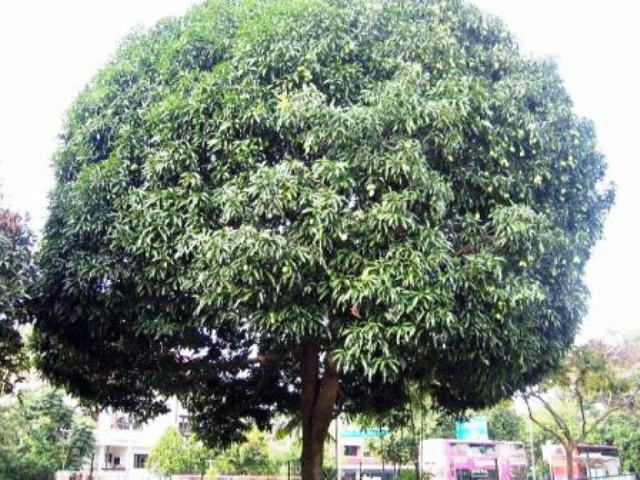 The trees can be looked after like mangoes. 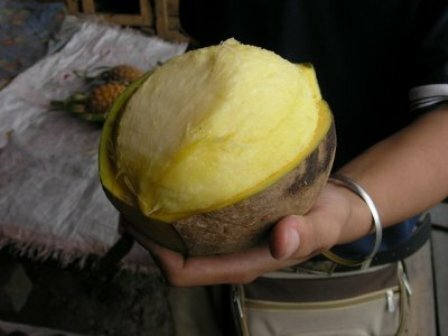 The large, aromatic fruits may of Membangan are liked by all outsiders who visit Indonesia. So this fruit is becoming popular elsewhere too. Therefore membangan seems to have sufficient scope for being developed as a new commercial crop outside South East Asia too.